The "Grand Canyon" of Vermont. Or at least they advertise it as such. What can I say? You walk out on a bridge, it's really high up, and oh yeah, the view is spectacular. But, you'll be hard pressed to not find a beautiful landscape everywhere you go in Vermont. 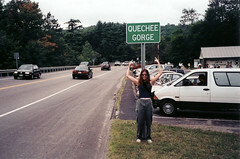 Is Quechee Gorge worth the deviation? It's chock full of tourists that seem to think so. And if you're looking for a cheesy souvenir this is the place. Unfortunately, rather than being a fun and corny stop, it bordered on being a little too much. Hard to believe that could happen to the Roadchix. There's a great Scottish store on the way. And don't forget the view from the bridge. So is it worth stopping? Hey, we can't tell you what to do, but this is not the Vermont that we know and love.